Gypsy Witch | "fate keeps on happening"
Every card in the Tacheles/Adolph Engel deck is duplicated in the Gypsy Witch. In fact, the Gypsy Witch is just a Tacheles deck with the addition of the Shepherd, Bear, Eye and Lion. Some of the art is so similar that you can see there was some copying going on. So if you wish you had a book about those crazy sigil decks, you probably already have one – a weird, unbound book first published over 100 years ago, no less! If you’re reading this, you’re almost certain to have a copy someplace – check the sock drawer, lol. If not, it can be purchased for about $7. 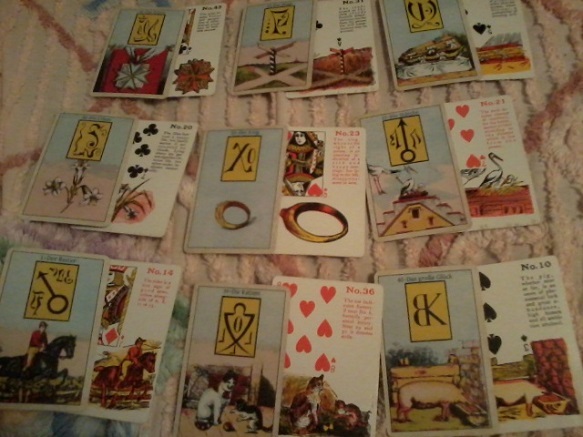 This is an old deck belonging to the Gypsy Witch/Whitman family of almost-Lenormands-with-extra-cards. 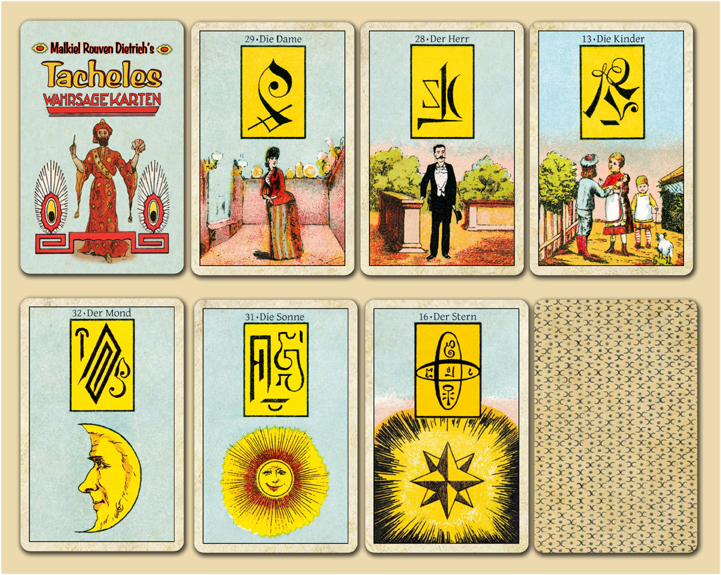 This version, Malkiel Rouven Dietrich’s Tacheles Cards, has been renumbered to follow Lenormand more closely. There are, however, differences, and I prefer reading this deck as a reduced Gypsy Witch, rather than as an expanded Lenormand. 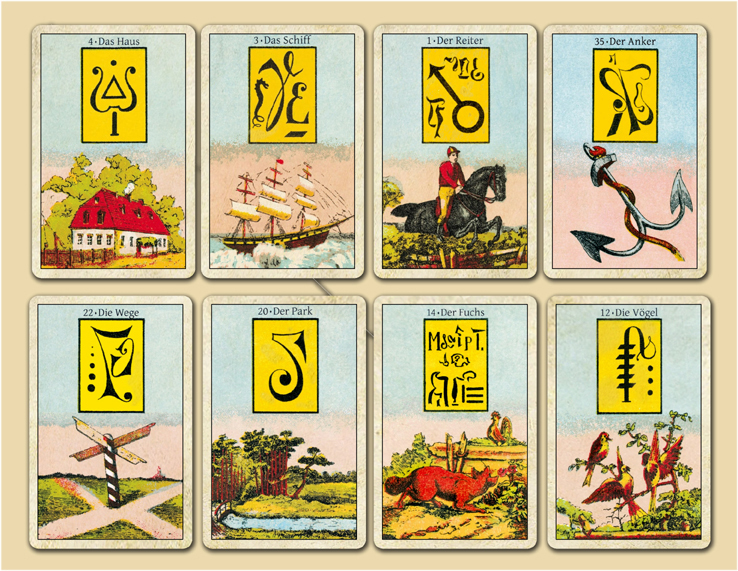 Lenormand really doesn’t need extra cards, and IME they tend to fuzz up the picture. Still, I find the familiar Lenormand numbering helpful for things like house positions. There is no Bear in this deck. Malkiel has assigned the Rose to #15, titled “Die Heiße Liebe”, “the hot love” – a natural progression of the Gypsy Witch “beauty and rugged health” and logical for red roses, but with no Bear card you’re going to have to look to other cards and combos for the meanings you normally assign to the Bear. The other extra cards are the Train, Lightning, Cats, Pig, Broken Mirror, Amor (Cupid), Crossed Swords, Bride, Clasped Hands, Money Safe, Wine, and Flames. All of these have their counterparts in the Gypsy Witch deck, and, with the exception of Wine, the Whitman. As for the insets, it’s been suggested that they’re sigils from the Lesser Key of Solomon (a tenuous and superficial connection at best – one could just as easily draw a parallel to the alphabet in On Beyond Zebra), and Tironian notes (though none of the people doing the suggesting have offered to translate.) While some of the squiggles may or may not be based on those, there’s a lot more going on here including tree branches, planetary glyphs, a clef note, and a seahorse/dragon. I wouldn’t waste my time trying to decipher them, they were obviously added for looks. I suppose an unscrupulous reader could make things up and scare a client into thinking they needed a curse removed, but I’d suggest being straight with your clients and telling them it’s for show. It’s a very snazzy-looking deck, obviously old, and brightly colored. “Tacheles” is a Yiddish word for “straight talking”, I think. 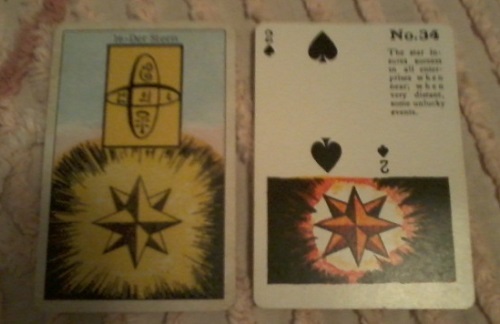 And it will do that, whether you read it as a Lenormand or a Gypsy Witch. It’s the PERFECT deck for those of us who love GW, but are put off by those dorky purple witches on the backs, or just don’t like using cards with printed meanings on them for client readings.